Starting point: Design a new town. The idea that public, recreational, residential and commercial spaces could be blended in an architecturally pleasing way should hardly have been radical, yet in 1965, in the USA, it was. Half a century later, it remains an outstanding reminder that vitality and peacefulness, work and play, aesthetics and efficiency, a built and natural environment, can be complementary. 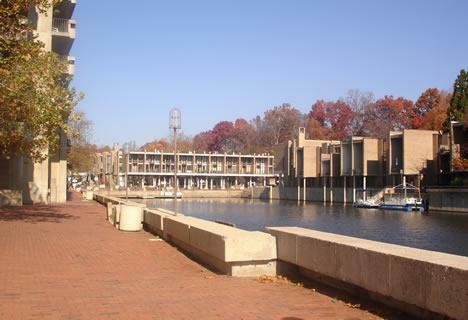 The first section of the community to be built, Lake Anne Plaza, was designed by James Rossant(who studied under Walter Gropius at Harvard University‘s Graduate School of Design) to emulate the Italian coastal town of Portofino. Lake Anne village was designed with modern architectural themes that extend to a nearby elementary school, a gasoline station, and two churches. Lake Anne also has an art gallery, several restaurants, the Reston Historic Trust Museum, shops, and a senior citizens’ fellowship house. All are local businesses, as there are no chain stores or chain restaurants allowed in Lake Anne. Close by are the cubist townhouses at Hickory Cluster that were designed by the noted modernist architect, Charles M. Goodman, in the international style. Other sections of the town, such as Hunters Woods, South Lakes, and North Point, were developed later, each with a neighborhood shopping center and supermarket. The careful planning and zoning within Reston allows for common grounds, several parks, large swaths of wooded areas with picturesque runs (streams), wildflower meadows, two golf courses, nearly 20 public swimming pools, bridle paths, a bike path, four lakes, tennis courts, and extensive foot pathways. These pathways, combined with bridges and tunnels, help to separate pedestrians from vehicular traffic and increase safety at certain street crossings. Reston was built in wooded areas of oak, maple, sycamore, and Virginia pine. The growth and development of Reston has been monitored by newspaper articles, national magazines, and scholarly journals on architecture and land use. In 1967 the First Lady of the United States, Mrs. Lyndon Johnson, visited Reston to take a walking tour along its pathways as part of her interest in beautification projects. Apollo 11 astronauts Neil Armstrong and Buzz Aldrin visited Reston elementary schools named for them. The Washington Postfeatured a road trip to Reston in January 2006 and a relatively new website “Beyond DC” has a page devoted to Reston with almost 150 photos. “There is another Reston, a place where people still live amid shops, galleries and restaurants in an open-air European-style plaza on the water’s edge. Developer Robert E. Simon had a dream. The son of an established New York real estate family, Simon parlayed the profits from his sale of Carnegie Hall and other family-owned properties into 11.5 acres in western Fairfax County. Simon wanted to create a town that had a mix of urban flair, neighborhood character and thriving commerce, not unlike the neighborhood where he had grown up, on 115th Street in New York City. Reston — the name derives from a combination of Simon’s initials and the English suffix for town — would be the culmination of this dream. 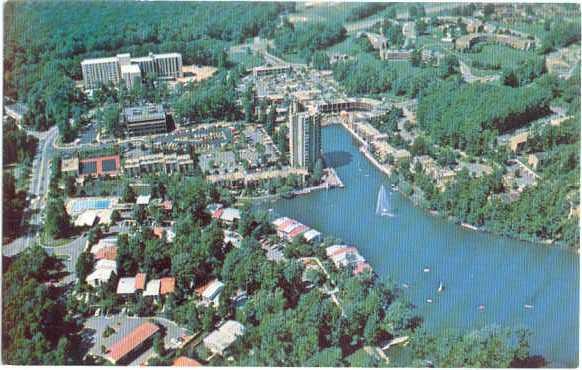 Today, at 85, Simon lives in an apartment in Reston’s Lake Anne Village, the town center he created. Modeled on the fishing village of Portofino, Italy, the concrete-and-brick plaza on the lake is home to many of the same residents and businesses as when it first opened in 1965 — unusual in a Washington-area community, where corporate relocation, political transfers and out-of-state transplants are commonplace. The plaza’s unique structural design has been featured in urban planning and architectural texts, noted particularly for its combined-use commercial and residential properties. Several apartments in Lake Anne are built above storefronts, a feature not typically seen in suburban development. But, then again, things are far from typical here. The Lake Anne Village Center exists as a self-contained entity. The stores, apartments and town houses form an enclave, a large semi-circle of housing and commerce facing a center courtyard with nothing but a lakeside view and a whimsical fountain sculpture in sight. The antithesis of the “strip mall” concept — driving to the door of any of these establishments is not a possibility — the design is far from driver-friendly. Parking is available in one central lot, located at the entrance to the center. The parking lot is best known to locals as the home of the Lake Anne Farmer’s Market, which is open Saturday mornings, May through November, and is considered by many as one of the best sources for area-grown produce, fresh herbs and baked goods. For most who live nearby, driving to Lake Anne is not a necessity; the Village Center is connected to most area neighborhoods by a series of linked walking paths and tunnels that bypass all street and highway traffic.